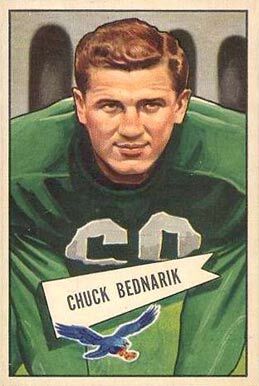 Hall of Famer Chuck Bednarick, who was one of the last NFL players to spend almost the entire the game on the field as he played both ways, died on Saturday at the age of 89. Everybody reminds me of it and I’m happy they remind me of it […] I’m proud and delighted to have played in that game. Chuck passed away in Richland, Pennsylvania, after a brief illness, according to a statement released by the Philadelphia Eagles. The Los Angeles Times quoted one of the Hall of Famer’s daughters, Pamela McWilliams, as having told the Easton paper that they “certainly didn’t have the safety equipment” back then as they do now and that she believed football played a role in her father’s dementia. The late football star who coached the Pittsburgh Steelers to four NFL titles is well remembered for a game-saving tackle at the nine-yard line during the final play of the 1960 NFL championship game in which he threw Jim Taylor, a running back for the Green Bay Packers, to the ground and refused to let him stand while the final seconds of the game ran off the clock. The Eagles, who he played center for at the time, won the championship game 17 to 13. What are your thoughts on the death of the legendary Chuck Bednarick?